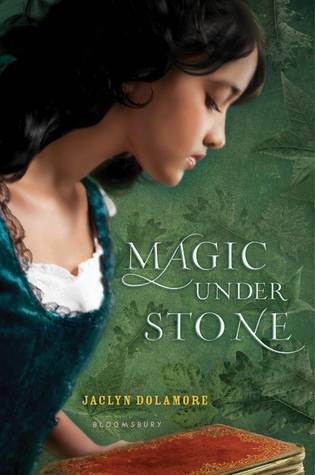 I have one copy of Magic Under Stone to give to one lucky winner. Please note this is a sequel! To enter, leave a comment answering this question: If a genie granted you 1 completely frivolous wish, what would it be? Hmm frivolous well I would say a kitten, but I get too attached to my pets and melt down in a freak out when they die or panic when when they cough. So I'm going to say free books for the rest of my life. Hmmm...completely frivolous? That's actually harder than I thought it would be! Hmmm...okay, I think I'd wish for a bank account that magically replenishes itself no matter how much I spent. I would go nuts on books and movies for sure. Also I would buy a lovely home and have it professionally decorated. And I would go to Paris every other weekend. Now I really need to meet a genie. I think Ems summed it up perfectly. I would wish to be transported to a deserted island for 24 hours where I would sit under a palm tree, listen to the ocean and read uninterrupted. After 24 hours later I return to life, kids etc. If a genie could grant me one wish I would have to choose to have acess to any book in the world! I'm that much of a bookworm lol! Thanks for the giveaway. I have to go with unlimited money for life. I mean, I don't need to be rich, but it would sure be nice not to have to work! I'm like the guy from Office Space...if I had the money, I would do absolutely nothing. And by nothing I mean read constantly. It would be wonderful to be able to get all the books I wanted, and not have to find down time to read them! Frivolously speaking, I'd like to be able to fly. Maybe that sounds too practical so I wouldn't be able to use it for any ordinary purpose, just for fun. One wish? To live out all of my dreams, no matter how small they are. I'd ask for the ability to teleport. No more dealing with buses and I could see my dog whenever I wanted. WIN. I would ask for perfect eyesight! It must be really nice to wake up and be able to see! My completely frivolous wish would be for a fresh-baked cookie and a glass of cold milk to appear every night as I was doing my before-bedtime reading. My frivolous wish would be a brand new kitchen. One completely frivolous wish? This is probably the stressed out college student in me...but I'd probably wish for a year off with no school, no job, and no bills to pay. Think I could squeeze that all in one wish? lol. My frivolous wish would be an unlimited supply of Pepsi Cola. One frivolous wish? That a Hickory Farms maple & brown sugar turkey stick would appear whenever and wherever I wanted one. If i could have one frivolous wish, id want to live in a castle with my family in scotland and the castle will have a huge library, that has all the books i want! ;D Thanks! Oh man, I want to be selfish and ask for something for myself like the body of a supermodel. But I suppose I should ask for my whole family, frivolous, A huge apartment with a view of the Cote d'Azure and of course the money to live the lifestyle there. Yeah, that would make everyone happy. I'll get a personal trainer! I would wish for a new home that was large enough that I could have a library and plenty of room for the kids to play! It might not be completely frivolour but if I could have a wish any wish in the whole world it would be to have my son back. To have him be with me and his family the way things were ment to be. If I could have one wish it would be for my children to have a happy, fulling life!!! I think if I had one completely frivolous wish, I would wish to be completely taken care of, i.e. whatever I needed at the moment, forever. That would be so cool! I would wish to be taller... that would be really awesome lol. I would wish for an unlimited supply of cheese. I would prob be selfish and ask for unlimited wishes if not I would give my wish away to my mom bc she deserves to get anything she wants she is the best mom I could ask for!!!! Completely frivolous? Any book I want for the rest of my life. But then I'd need more bookshelves!